Mountain lions have been known on occasion to take down a coyote. However, the primary predator of the coyote is the wolf. 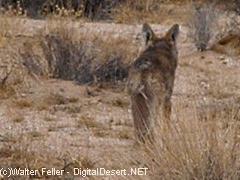 Since the wolf has been eliminated from the desert scene, the main killer of the coyote is man.